Dermal fillers like Juvederm, Restylane, and Radiesse are all top choices for wrinkle-conscious patients. Dermal fillers work by plumping up depressed areas. In other words, they provide filler underneath moderate to deep lines and wrinkles. This results in a natural-looking—and often, long-lasting—appearance. 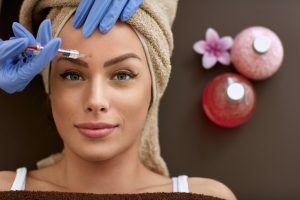 But there are a few other ways that plastic surgeons are using dermal fillers that may surprise you. For instance, did you know that you can use dermal fillers to erase your depressed scars and plump up your lips? If you live in or near New York City or you’ll be visiting this summer, you’re invited to come visit Dr. Loeb’s office in Manhattan. You’ll receive a customized set of treatment recommendations, which might include the creative use of dermal fillers. Skin problems aren’t always temporary. Sometimes, they can haunt you for years, and they might not always respond well to attempts at camouflage with makeup. A case in point is acne. Even after an active breakout resolves, the depressed, pitted scars will linger. Dermal fillers are an exciting new way to treat acne scars quickly, safely, and effectively. Just like wrinkles, depressed scars can be lifted up with long-lasting dermal filler solutions. The temples are an oft-overlooked area. Most young people probably don’t pay them any attention, but as a person grows older, the temples can gradually develop a hollowed or sunken appearance. This subtle sign of aging can betray your years even if you’ve received rejuvenating skin treatments elsewhere on your face. A plastic surgeon can use dermal fillers like Sculptra or Juvederm to subtly fill in the sunken areas. You’ll look younger, but no one will be able to figure out why. Lip fillers have skyrocketed in popularity, thanks at least in part to celebrities who have embraced the pouty lip trend. Full, plump lips give the face a sensuous look that also makes a person look younger. Fillers based on hyaluronic acid are the most common type used for lip augmentation. These are safer and longer lasting compared to previous approaches to lip augmentation. With lip augmentation, one major concern is overdoing the effect. This is primarily a problem when the patient chooses an inexperienced or unqualified provider. Instead, go to a board-certified plastic surgeon to ensure you get the look you want. Plastic surgeons know how to inject exactly the right amount of filler into the bottom lip. Less, if any, is needed for the top lip to create a pouty look. Your plastic surgeon may even inject very small amounts of filler during different appointments. This lets you get used to your new look gradually and avoid plumping up the lips too much. In addition to his expertise in plastic surgeries, Dr. Thomas Loeb is a skilled provider of skin treatments such as dermal fillers. At our Upper East Side office in NYC, you’ll find a full suite of skin rejuvenation treatments to restore your youthful beauty. Dr. Loeb offers Juvederm, Juvederm Voluma, Sculptra, Restylane, and Radiesse. Call today to request a one-on-one consultation with Dr. Loeb.